Since it's creation in 1988, the Sunflower Festival has been entertaining blues fans for the past 26 years. Throughout the years there have been numerous high profile headliners and entertainers such as Robert Plant, Ike Turner, Dorothy Moore and for this years 26th annual festival, Bobby Rush. 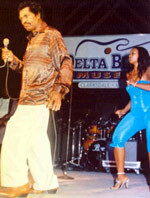 This years events at the Museum will include a panel discussion of Arthneice "Gas Man" Jones featuring members from his Stone Gas Band; the opening of the Museum's new exhibit "26 Years of Sunflower" and of course all the great performances to be viewed on the recently renamed DBM "Melville C. Tillis" stage. The 2013 Sunflower Festival included performances by the DBM Band, headliner Bobby Rush; with special events at the Museum and Ground Zero Blues Club honoring the late Arthneice "Gas Man" Jones; the opening of the new museum exhibit "25 Years of Sunflower" and much more.